Beth, who has aniridia, and her sighted son Edward are taking part in research into his development. Researchers want to know how having a visually impaired care giver affects babies. Beth says she can “highly recommend taking part” so we recorded a 5 minute interview during their latest visit to the Babylab. 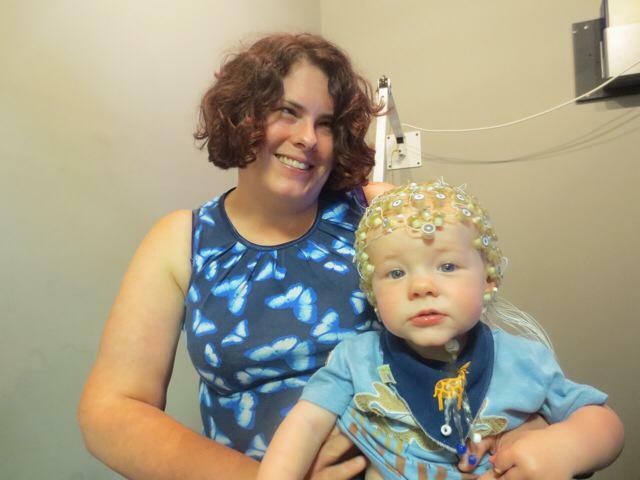 The Centre for Brain and Cognitive Development (CBCD) at Brikbeck College London are exploring how babies like Edward develop brain mechanism and skills for social communication when dealing with one or more blind care giver. Find out more about the study and how to take part. I have no eye colour but I do have an iPad, a guide dog called Annie and a pink long cane. This entry was posted in Parents' accounts, Patients' tales, Research and tagged research. Bookmark the permalink. Lovely to hear about your clearly excellent progress in motherhood. Wonderful mother and child photos. It must be reassuring to have this opportunity to check Edward’s progress. Presumably they can also amswer some of your concerns. Veronica they have found the babies are better at finding patterns in their environment than babies with sighted parents and that they are more vocal. Which was very interesting to find out.